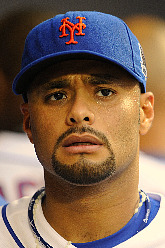 Home » 10-11 Offseason » What Are Johan Santana's Chances of Recovery? On Saturday, Steve Popper and Bob Klapisch of the Bergen Record dropped the bomb that Johan Santana’s 2011 season might be in jeopardy. Well, it’s only a bomb if you don’t read MetsToday; we wrote off Johan’s 2011 way back in early September. But that’s just me being all “gloom and doom” … or a realistic view of the situation, depending on your outlook. Personally, I tend to have low expectations for pitchers returning from serious shoulder injuries, and didn’t see any reason to view Santana’s injury any differently. It made more sense, to me, to plan the 2011 Mets pitching staff without Santana — and if by some small miracle he made a comeback, it would be a wonderful and welcome surprise. But planning without Santana doesn’t sell tickets, and the Mets are desperate for revenues. So, the team will continue to spin the fantasy of Johan’s return at some point in 2011. Putting that aside for a moment, we must wonder if Santana will be able to return by 2012 — and if he does, will he be anything near the ace starter he was before shoulder surgery? The odds are stacked against him, heavily — if history is any indication. I certainly missed many pitchers who never made it all the way back from a major shoulder injury. I might have missed a few success stories — please add them in the comments. The point is, full recovery and true “success” is a rarity when it comes to major shoulder injuries and shoulder surgery in particular. What makes this more dismal is that nearly all of the pitchers on these lists suffered less-damaging injuries that required less-invasive surgeries; in almost all cases, the pitcher had a frayed labrum and/or torn rotator cuff that required arthroscopic surgery. With the “typical” surgery performed above, it takes most pitchers a minimum of 10 months to a year to get back on the mound. Mind you, that doesn’t necessarily mean that they’re pitching effectively off of a mound; Freddy Garcia is a very typical example of the normal course of action. Since he’s a success story, and we want to be optimistic about Johan Santana’s future, let’s delve into the Garcia story. Ironically, Garcia and Santana have a lot in common. Both are Venezuelan, both were originally signed by the Astros, both were dominant pitchers in the AL Central, and both were befelled by shoulder injuries that required surgery. Garcia had his surgery in late August 2007. Garcia finished his rehab and began showcasing his talents to MLB teams in August 2008 — just short of a full year later. At that time, his velocity topped out in the mid-80s and he signed with the Tigers, pitching 15 innings before leaving a game with a “stiff” shoulder and ending his season. You may remember that Garcia’s comeback continued unsuccessfully in Port St. Lucie the following spring, nearly retired after struggling to keep his velocity in the 80s, and was eventually released after pitching terribly in AAA Buffalo. A few months later he signed with the White Sox, was called up in August, and finally began pitching effectively again in the last month of the season. Mind you, that was September 2009 — a full two years after his shoulder surgery. Something to consider with the case of Freddy Garcia: despite making 28 starts and going 12-6 last year, he wasn’t nearly the pitcher he was before, and his velocity was in the 85-86 MPH range. There are reports that he’s up to 89 MPH in Yankees camp this spring, and if so, that’s great — but it also means it took him over 3 1/2 years to get there. Also, I haven’t been able to pinpoint what type of surgery Garcia had; meaning, whether it was a simple arthroscopic procedure or a more invasive one, such as what was done to Johan Santana. I’m fairly sure that all of the other success stories occurred after comparatively minor arthroscopic procedures, and only Garcia and Lilly were over 30 at the time of the surgery (Santana is 31 going on 32). Additionally, Clemens might have had some “special help” for all we know. If Garcia’s example is a point of reference, Santana will not be a reliable MLB starting pitcher until sometime in 2013, or possibly 2014. In case you’re wondering, Santana’s contract expires at the end of ’13, though there is a $25M option for ’14 that the Mets may exercise. There are two players — both catchers — who reportedly suffered similar injuries to what Santana sustained, and who had similar procedures: Jorge Posada and Gregg Zaun (Santana himself made the Posada comparison). If you saw Posada play last year, you know he couldn’t throw out the garbage, much less opposing runners, and is slated to be a full-time DH this year mainly because he can’t throw. And as for Zaun, his shoulder wasn’t quite right after surgery and he retired last week because of it. Sorry for the gloom and doom, but personally, I think it’s best to just write off Johan Santana for the rest of this year and hope he can make a return at some point in mid- to late 2012 — though with what effectiveness, no one can guess. While researching the risk/reward articles posted earlier this winter, I couldn’t help but notice all the pitchers who were trying to come back from shoulder problems. I combined that list with others from the past, to try to get a handle on the recent history of pitchers returning from shoulder surgery. Good stuff Joe. Something I often debate with sports fans is the “Should he just wait until next year?” question. My answer is usually no. Unless we are talking one month or a few weeks, then yes, regardless of the team’s position in the standings the results on the field may not be worth the benefit gained to the player. But if Santana can get in five or more starts I’m not sure I can say I would not do it. The rigorous path to recovery is much easier to accomplish if it results in getting back on the field, instead of another 3 months of rehab/training. If he can be ready, getting him a few starts seems worthwhile especially considering the team’s likely place in the standings (i.e. the basement). Joe, is it better to get him a few starts if he can do it? Or is it better to have absolutely no risk of rushing him and re-injury/setbacks? It seems to me like getting starts is the way to go if possible. Of course, every individual is different, so it’s hard to comment. But generally speaking, and based on past case histories, I’d be inclined to say that it’s NOT better to get a pitcher back on the mound in MLB games if it’s unnecessary — but particularly in the case of more serious “reconstructive” surgeries such as what Santana experienced. I look at all the setbacks suffered by Mark Prior, Freddy Garcia, Ben Sheets, etc., and with most of them, it was a situation of the player going back on the mound too early — be it because of their competitive juices, financial reasons, whatever. Further, I don’t believe that the typical rehab program of an MLBer includes significant study — by a scientist — of what caused the injury in the first place, and what can be done to prevent it from happening again in the future. As a result, most if not all of these pitchers return to their same awful mechanics (see John Maine), which may contribute to a longer rehabilitation period, setbacks in the process, and/or reinjuring the arm in the future. Maybe if the team decided right now that Santana would be out for the entire season, they would take the time to get the opinion of both qualitative and quantitative biomechanic experts to find out why Santana destroyed his shoulder and help him make changes to his motion that will get him back to being an ace pitcher — or at least, a usable MLB starter. Whether or not Santana’s “on-schedule” really means very little to me at this stage of the game. These guys can type ’til their fingers fall off, and all it is right now is speculation. Truth be told, I didn’t expect to see him until after the ASB – more trade deadline, anyway. Even still, expectations for 2011 are tempered for me. Why would anyone want him to rush back for anything this year – unless he was feeling as close to “healthy” as he could potentially be? The true test will be 2012. How he holds up for the duration of this contract is key. At this point, I just think everyone’s looking to go nutty with the long-term state of the Mets. We can’t be worrying about this right now (on March 13th), simply because anything he provides in 2011 is gravy, anyway. Prediction: I think this will finally be the year that sends Santana over the edge with the Mets. The state of the team won’t be worth him rushing back….and as more details come out about this shady ownership squad; I think he’ll start expressing “things” a bit more as his rehab/the summer progresses. Owed a lot of money, yes…..but does he want to sit here with this team constantly rebuilding? This was an eye-opening article. Good work. ultra-competitiveness. I’m not sure that his psyche will allow him to avoid overreaching and try to take the mound before he is truly ready. I think you are quite right about his competitiveness — and again, I point to The Chief Garcia as an example of what happens when competitors make their way back perhaps too early, and as a result suffer setbacks — the main trouble is a myopic view of reality; the athlete will always want to feel he is better than he is, and/or shrug off warning signs.